A while back, I gave you a peek at a commission I was working on using printed text. 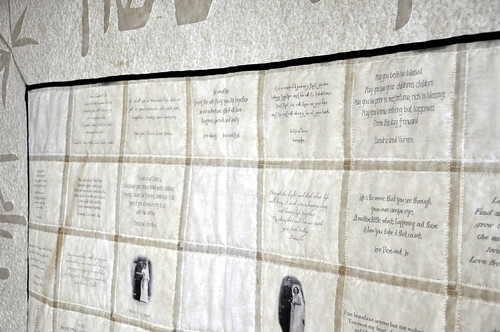 Well, I couldn't show you much more than that, as the piece was destined to be used as a chuppah at a wedding and I didn't think it was right to show you the quilt before it was seen by the wedding party and guests. That time has passed now, so I can reveal all. 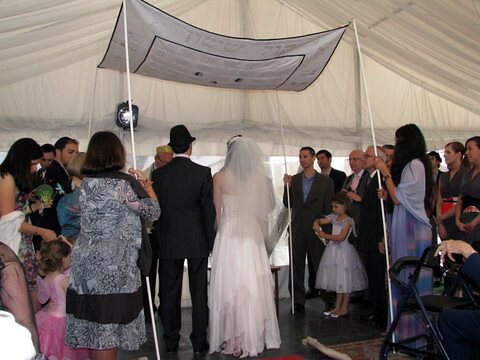 The idea behind this chuppah was to create a communal piece with input from many of the wedding guests. 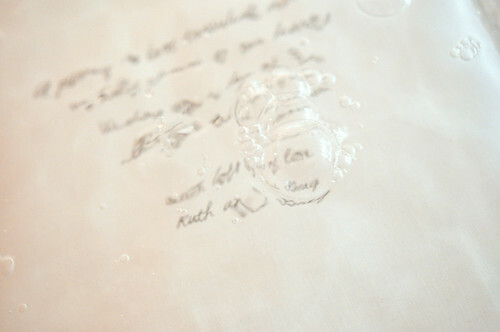 Guests were asked to send in a message for the bride and groom. 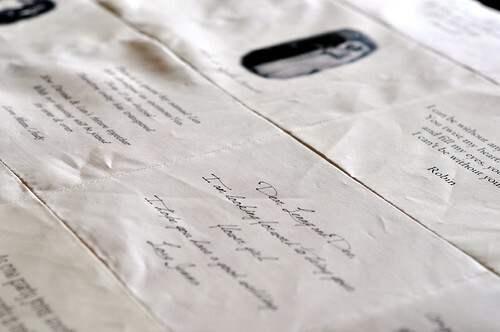 I then formatted the messages in a variety of fonts and printed them onto printable fabric sheets. As well as messages, a selection of black and white wedding photos of the couple's parents and grandparents were included. These sheets needed to be soaked to set the image. Once they were dry, they could be pieced together. 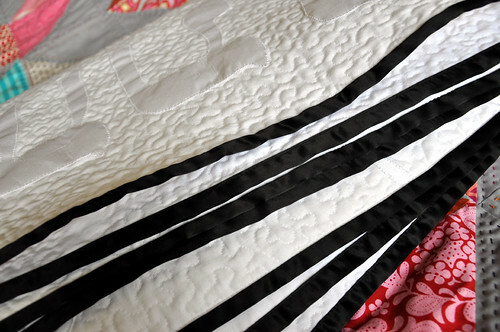 I was nervous about pin basting this quilt as the printable fabric is very tightly woven and the pins really do leave little holes in the fabric. So I compromised and spray basted the central part of the quilt and pinned the regular white cotton of the border. Then I quilted and quilted and quilted. Straight line quilting in the central part and stippling in the border. You can really see the quilting with the light behind the chuppah. Song of joy and gladness, song of bride and groom. Mazal tov Len and Davina. Thank you for allowing me to play a part in your special day. WOW! That is magnificent Andi! They must have been thrilled. I love that the women are holding it up too. ANDI!! that is brilliant- what a beautiful keepsake, how gorgeous it is. Did they absolutely love it? What a beautiful idea. 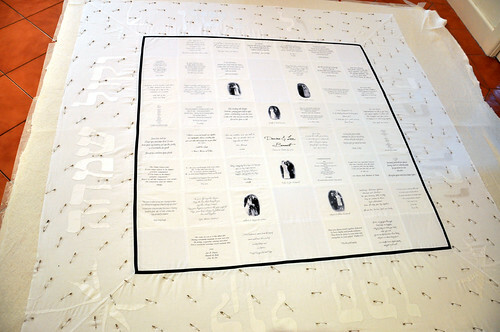 I have a poster with well wishes on it from Victoria's baptism and I have been looking at it wondering if I could make it into a quilt for her if I printed the well wishes onto fabric. it looks fabulous finished Andi! I'm sure they loved it. That is so special Andi & I'm sure it will be treasured for generations. Mazel tov to the happy couple. I am sure that will be a family heirloom. My kids are getting old enough that I should be thinking of making a family chuppah. What a good idea. You came up absolute trumps. (But I can imagine the relief in being able to hand over that particular piece of perfection!). What a beuatiful and special quilt! Great job! And all that white! So brave and challenging to work with and quilt! wow, that is an amazing quilt! This is just stunning! A beautiful treasure for the new little family! We made our chuppah from woven ribbons (before my blogging days ::sigh::) and this made me smile thinking back on ours! Mazel Tov to you and the new family! That is awesome! What a fantastic family keepsake! It turned out gorgeous! 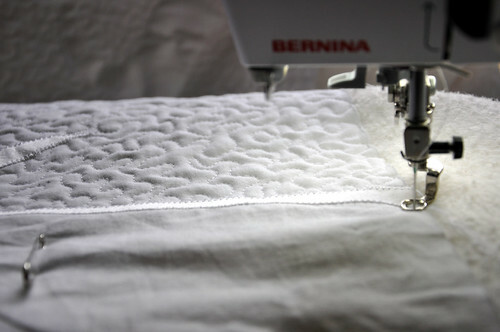 You are an absolute quilting GENIUS! What an amazing idea and gift for the couple. I love the whole process. Pure genius. 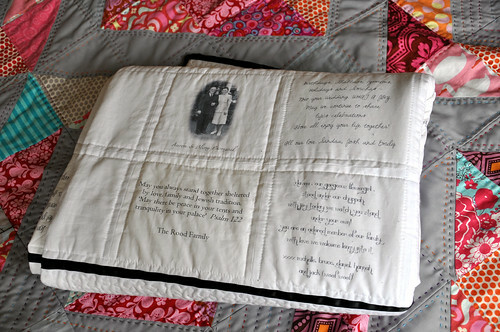 So special, so original and so much from the heart - a fantastic wedding gift. That IS special, wow! what a beautiful job Andi. Wow - magnificent is really the only word I can think of. What a treasure! Stunning and special, Andi. The happy couple will cherish this beautiful gift all the more as the years pass.